What is an impacted (unerupted) tooth? An impacted (unerupted) tooth is a tooth that fails to fully pass through the gum tissues as something (dense soft tissue, bone, tooth malposition, cysts, or another tooth) prevent its normal eruption into the mouth. If a tooth fails to emerge, or emerges only partially, it is considered to be impacted. Patients frequently develop problems associated with impacted wisdom teeth, which are the most common form of impacted teeth that need removal. (See Wisdom Teeth Extraction under our services). The second most common teeth to become impacted are the maxillary cuspids (upper eye tooth or canine). These teeth are the last of the “front teeth” to erupt and normally come into position around the age of 13. If an upper cuspid becomes impacted, every effort is made to help it to erupt into position because these teeth play a crucial role in the dental arch. They are designed to be the first teeth to touch when your jaws are closed together and help guide your remaining teeth into the proper occlusion (bite). They are the foundation of an esthetic smile and functional occlusion. Other commonly impacted teeth include the second molars, bicuspids, and the lower jaw cuspids. Too little space available causing an eruption problem of adult teeth. Unusual Growths that are blocking the eruption of certain types of teeth. Once the need for orthodontic treatment is identified, braces and initial orthodontic treatment is begun to allow for proper eruption of the adult teeth. At this point, your orthodontist may refer you to our office for the extraction of primary (baby) or permanent (adult) teeth, supernumerary teeth (extra teeth) or growths that block the eruption of the impacted teeth. Upon your initial visit to our office, you will be evaluated by our doctors on an individual basis and panorex radiographs will be taken to determine the position of the impacted tooth to the adjacent teeth. Occasionally, Cone Beam Volume Scan will be taken if the doctor feels it is necessary to further assess the position and overall stage of the dental development of the tooth before a definitive treatment plan can be finalized. Extraction of Teeth – Extraction of an “over retained” primary tooth (a primary tooth still in position with a permanent tooth trying to come into the same space) and/or permanent teeth that are blocking the eruption of the tooth to be brought into position. Extraction of Extra Teeth – Removal of “extra teeth” (supernumerary teeth) or growths that are blocking the eruption of the tooth. Surgical Exposure of the unerupted tooth – Removal of gum tissue and bone overlying the tooth are removed to expose the impacted tooth underneath. This will create access for your Orthodontist to attach an orthodontic appliance to help the tooth erupt. 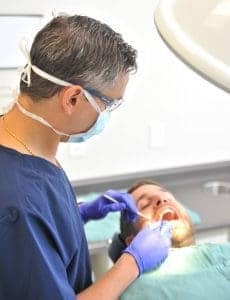 Depending on the individual case, our doctors might place a periodontal packing over the tooth where it will remain until your post-operative appointment. Following surgical intervention you will be referred back to your Orthodontist where he/she will slowly move the exposed tooth into its proper position in the dental arch. Surgical Exposure of the impacted tooth and placement of an orthodontic bracket and chain to the exposed tooth – Elevation of gum tissue and removal of bone overlying the tooth is done to expose the impacted tooth underneath. Once the tooth is exposed, our doctors will bond an orthodontic bracket and chain to the exposed tooth. The chain will then be attached to the orthodontic appliance (previously placed by your orthodontist) where it will remain temporarily. Depending on the individual case, our doctors might place a periodontal packing (Barricaid) over the tooth where it will remain until your post-operative appointment. Following surgical intervention you will be referred back to your orthodontist where he/she will slowly move the exposed tooth into its proper position in the dental arch. Extraction of the unerupted tooth – This normally occurs in cases where a tooth will not move despite the efforts of an orthodontist. If extraction of the tooth is the only choice for treatment, our doctors will discuss treatment options to replace the missing tooth in your dental arch. Leave the unerupted tooth alone – If the tooth is left in place, our doctors will discuss treatment options and possible consequences of leaving the tooth. For more information on Exposure of Impacted Teeth, please call us today!